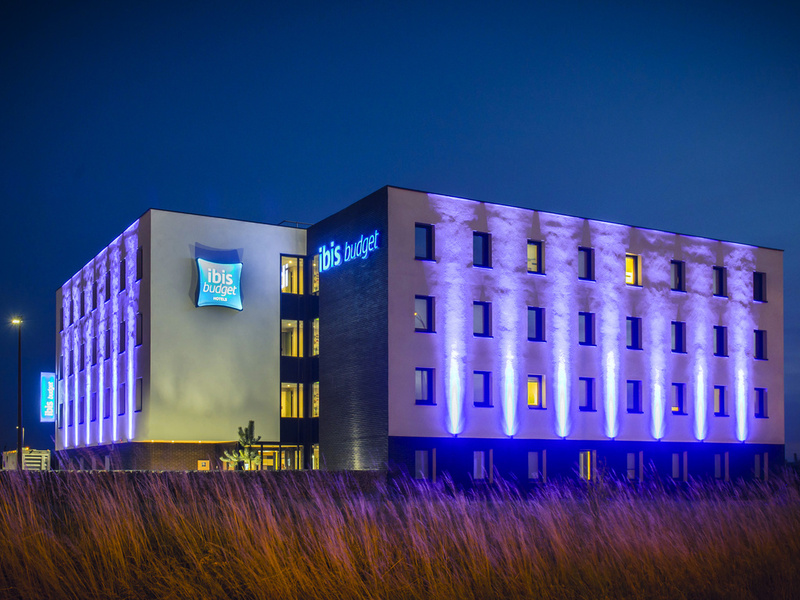 The ibis budget Troyes Est is the new hotel in Troyes. Ideally located 5 minutes from the city center, at the east-west bypass junction, just 5 minutes from the A26 highway. Factory outlet stores are less than 5 minutes away, and guests can enjoy the lake s of the Orient Forest, 20 minutes away. Reception is open 24/7. 83 air-conditioned rooms for 1, 2 or 3 people, in the new Cocoon style, equipped with new bedding, Canal+ channels and free WIFI. Free, secure private car park. Restaurants nearby. The hotel is located a few minutes from all the factory outlets and in the heart of the Be Green open-air center. Come and visit the historic center of Troyes, its cathedral and its stained glass windows, only 3.1 miles (5 kilometers) away. Nigloland theme park is 12.4 miles (20 kilometers) away, perfect for your family vacations. The hotel is ideally located only 10 minutes from the start of the Champagne route. A very positive experience. Secure parking and close to the motorway, easy to find. Efficient and warm welcome at reception. Clean rooms with everything we needed. A good night’s rest. Everything as we would wish it to be - bar one thing..... the coffee at breakfast was disgusting! Sorry, but that’s really important with an early start and 6 hours of driving ahead. I think the milk must have been sour or a problem with the machine. Would definitely stay here again as it was so suitable for a journey we do very frequently, proximity to route, clean and efficient. And you welcomed our dog! Thank you. Perfect stop for skiing trip stop over, clean and comfortable beds good simple breakfast What’s not to like! Basic but clean and comfortable. We often stay overnight at St Parres when driving from Calais. Tried the Ibis when it first opened and liked it. Rooms are clean comfortable and all we need for a short stay. Breakfast is good too. There is a good choice of eating places within walking distance. It is easy to find not far from the motorway and 24 hour fuel available at the nearby supermarket. Small, compact room. Beds quite firm but suited me, slightly too firm for my wife. Room very warm, no fresh air unless we opened the window but then a little too cool. Would be good if window could be opened and fixed in various stages. A small kettle in the room would be very useful for making a cup of tea or coffee. It was fine for the odd nights say en-route to our home in the south of France. The bed was not as comfortable as some Ibis Budget hotels. The price is higher than I would expect to pay for a similar class of hotel in England and breakfast is overpriced,but that's France. There are a couple of cheap restaurants within a short walk. I have only just discovered this hotel and it does look very new. Perfectly situated a couple of minutes from the autoroute it was ideal on our drive down to the Alps. Modern, very clean and with a comfortable bed, I couldn’t fault it. The shower was larger than many Ibis budget hotels I’ve stayed in with a good pressure of water. Breakfast too was good value for money. Hope to stay here again. Bed for the night. Quiet safe and secure with a nice breakfast to get you going in the morning. We were on our way home from a two week skiing holiday in Savoire and stopped at this hotel on the way. We were very impressed by the hotel, the room was warm and cosy, the whole hotel was very clean and welcoming and we had a great nights sleep. Although the hotel was full the breakfast was great and the waitress kept the food topped up so we didn't run out of anything. We asked for a room away from the road as we live in a small village and are not used to traffic noise, we were given a room at the back of the hotel just as we requested. We will definitely stay in this hotel again when we are in the area. Pleasant and friendly check-in, room was ready, clean, warm and comfy. All the needed amenities were included with a lovely hot shower. Breakfast was self-serve but very good and welcoming. Highly recommended and excellent value. Clean, friendly, helpful. We were very late. But the lady at the desk was very kind. We had no reservation for a restaurant, so she made one. In our group there is a vegetarian, this was no problem. Breakfast was oké. Stayed here en route to the south of France. Hotel was clean and tidy and the staff helpful. Excellent location, great value for money and a reasonable breakfast as well. Secure off street parking included. Altogether a nice hotel. Room was plain but clean. I had a good, quiet nights sleep. The hotel is in easy reach of restaurants and a bar. There is outside parking, and is free. Easy access from the motorway and other main roads.